The nationwide jockeying for HQ2 has sparked a debate about the trade-offs cities and states make to lure megaprojects. That’s playing out in Pittsburgh, where community groups are looking at what they can do to keep their neighborhood intact if Amazon comes to town. PITTSBURGH — For more than a century, the Hazelwood neighborhood prospered in the shadow of the steel industry. That ended when the local plant was shuttered and stripped nearly 20 years ago, but the community today is once again the focus of a corporate titan. Amazon is widely thought to be considering the neighborhood’s former industrial site among the dozens of places still in the running to host its second headquarters campus, or HQ2. Amazon would have a lot to offer. More jobs. Investment in infrastructure. Renewal after years spent staving off decay. But for a working-class neighborhood that has tried to steady itself in the decades since the steel bust, there is also unease at the thought of a new corporate heavyweight. Instead, Hicks and others worry that if Amazon comes to town, many in Hazelwood may wind up pushed out of the city altogether. When Amazon unveiled its HQ2 plan in September, it said its second home would bloom into a facility of 50,000 employees with an average salary of more than $100,000 a year. Mayors and governors lined up to seek the company’s unprecedented project, rolling out the red carpet, and in many cases opening the public purse, in an effort to land the second headquarters of the Seattle company. In January, Amazon announced that Pittsburgh and 19 other places had made the shortlist. The company, which says it aims to make a final HQ2 decision sometime this year, has since sent representatives out for site visits and asked some cities for additional details on their bids. But in addition to the nationwide jockeying for HQ2, the search has sparked a debate about economic development and the trade-offs cities and states make to lure megaprojects. Labor and community leaders have asked Amazon to hold talks with grass-roots leaders in whichever town it chooses. 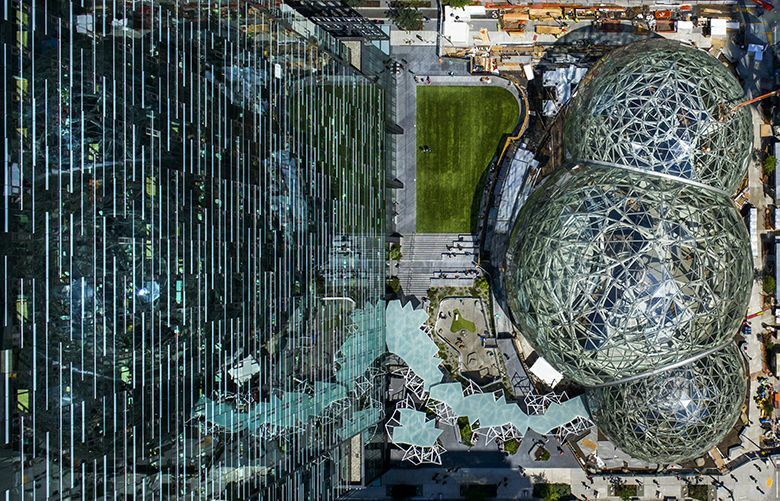 Economists and urban planners, meanwhile, have urged cities to forgo a bidding war to secure Amazon’s HQ2, arguing that money spent on tax breaks and other incentives makes for bad policy. Groups at the local level — from a tenants’ union in Austin, Texas, to transit advocates in Chicago and a quality-of-life watchdog in Nashville, Tennessee, — have urged caution. Pittsburgh, where community groups are working on ways to keep their neighborhood intact if Amazon comes to town, offers a window into the emerging grass-roots debate taking place around the U.S. The architects of the city’s HQ2 bid point out that few places have as much to gain from a new corporate champion as Pittsburgh. The city’s population fell by 30 percent between 1970 and 1990 as the hometown steel industry collapsed. Today, Pittsburgh is home to 303,000 people, the second smallest city still in contention for HQ2, just eclipsing Newark, N.J.’s 281,000. Growing health-care and education sectors have displaced metalmaking and manufacturing as the biggest employers. Still, the city feels like a place built to handle much more activity. Vacant lots and condemned buildings dot neighborhoods that are walking distance from major business and entertainment districts. In the last 30 years, “the culture, in a sense, has been all growth is good, all investment is good,” said Chris Briem, an economist at the University of Pittsburgh’s Center for Social and Urban Research. The two rivers that meet near Pittsburgh’s downtown to form the Ohio River carved the city’s landscape into a series of bluffs, making travel between some neighborhoods a climb or a circuitous drive. The waterways themselves used to be a conduit to cheaply move goods like coal and iron ore, fueling the steel industry that developed on the riverbanks. Working-class neighborhoods grew up on the nearby flats and slopes. The wealthy, able to commute to neighborhoods less scarred by grime, made their homes on interior bluffs. The neighborhood of Hazelwood sits along the Monongahela River. Brick row houses with covered porches are nestled in a tight street grid that climbs eastward into the hills. Second Avenue, the main drag, runs along the edge of the old mill site before entering a core of storefronts and churches. At its peak in the 1960s, Hazelwood was home to about 15,000 people, a mix of European immigrants and African Americans, many of whom had migrated from the South. Hazelwood’s LTV Coke Works, the source of thousands of well-paying jobs as well as the neighborhood’s occasional sulfur smell, was the last operating steel plant in Pittsburgh when it closed in 1998. Hazelwood today is home to about 5,000 people, split roughly evenly between white residents and people of color. The mill site, cleaned up and awaiting redevelopment, is officially called Hazelwood Green. During a visit one chilly February afternoon, it was brown. Dormant tall grass surrounds the steel rib cage of Mill 19, the last big plant structure standing. A road cutting through the 178-acre site is lined with streetlights, pedestrian benches and parking signs, a ghost town missing its citizens. It’s unclear whether the site, which is owned by a consortium of foundations, was offered to Amazon as part of Pittsburgh’s HQ2 bid. The city hasn’t released the details of its pitch, and is fighting a court order that it do so. “You can’t have 1.3 million people negotiating a deal,” Allegheny County Executive Rich Fitzgerald told tech news site GeekWire, referring to the county’s population. But Hazelwood Green, the biggest open parcel in Pittsburgh, is usually on the menu when the city courts big companies. Uber has occupied the southern end of the site since 2016, using a walled-off space as a test track for self-driving vehicles. 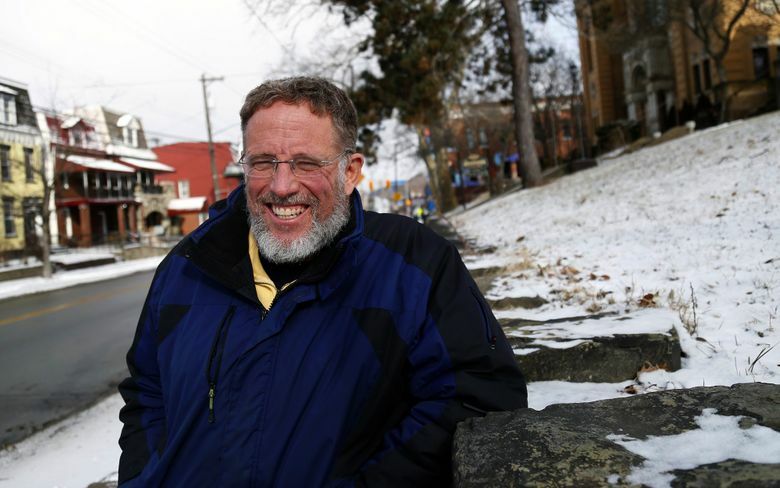 “Right now, we are guessing in Hazelwood,” Corey O’Connor, who represents the neighborhood on the Pittsburgh City Council, said in an interview in his City Hall office. O’Connor, who said he hasn’t seen the region’s Amazon bid, finds himself in a difficult position: How do you help constituents prepare for the company’s potential arrival if you don’t know what the city is offering? He has some ideas on policies to push before Amazon arrives. In December, O’Connor was among a group of council members who brokered a deal to tax home sales to pay for a $10 million-a-year affordable-housing fund, a proposal long in the works to combat displacement of low-income residents from the city. He’s hoping to build on that with a bill that would give the city the power to add deed restrictions to the thousands of homes and parcels bought up by the city and its redevelopment authority, primarily during the bust years. That could allow the authorities to set caps on rent increases or sale prices among future private owners of the property, an effort to keep the city accessible to low-income residents. For O’Connor and many of his constituents, Seattle’s experience with the retailer’s first headquarters is a cautionary tale. “It’s something that scares a lot of people,” he said. Jason Beery, a researcher at a Pittsburgh consulting firm called the UrbanKind Institute, stood in front of a crowd of about 100 in a county building in downtown Pittsburgh in February and recited, with great specificity, the statistics of Seattle’s Amazon boom. Seattle added 100,000 new residents over a seven-year period, outstripping the ability of the transportation network to move those people around. Homelessness surged. Longtime residents found themselves bound for distant suburbs in search of an affordable place to live. When Beery cited Seattle’s median home price — more than $700,000 — some in the audience gasped. Others silently shook their heads. The median home value in Pittsburgh is $130,000, according to real-estate tracker Zillow. Rental homes a short walk from the city’s major employers can be found for less than $750 a month. As big cities on the coasts grapple with rising income inequality and unaffordability for many, Pittsburgh remains a place where many retirees, college students, front-line retail workers and artists can live comfortably. 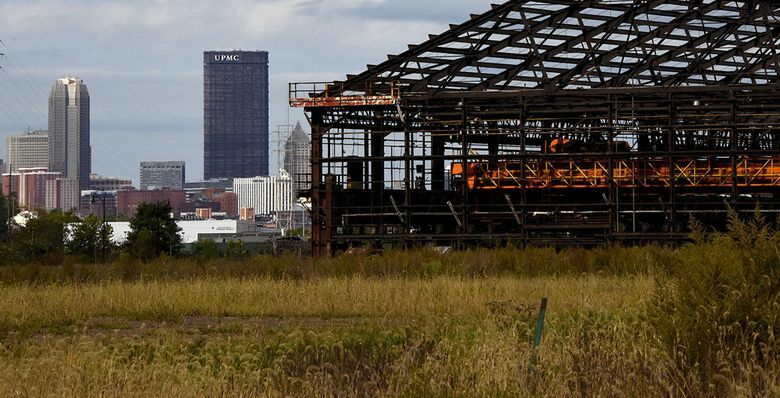 But the city is starting to show signs of stress, the legacy of a lack of investment in housing and a growing high-tech scene seeded in part by Carnegie Mellon University’s world-class engineering and computer-science programs. The fast-gentrifying Pittsburgh neighborhood of East Liberty, near a Google research and development office, has become a flashpoint. The city government and a developer spent much of last year mired in legal disputes over plans to demolish an apartment complex that houses many low-income residents and replace it with a Whole Foods and market-rate apartments. Hazelwood has notched some redevelopment successes in recent years. It opened a new library and community center and welcomed a French bakery to Second Avenue. A mom-and-pop market, filled primarily with locally sourced food, opened in 2016, the first grocer in the neighborhood in eight years. A developer wants to renovate a shuttered, historic house for use as a Scottish restaurant and pub. 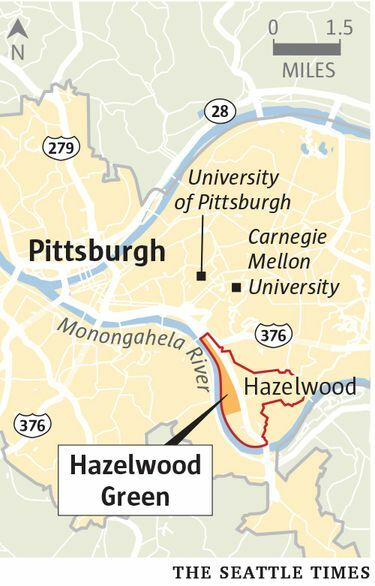 Then in January — after Pittsburgh made Amazon’s HQ2 shortlist — news broke that an out-of-town investor had spent $1 million to scoop up 18 properties in Hazelwood, many of them adjacent to the potential Amazon development site. Residents reported receiving unsolicited letters offering to buy their homes. 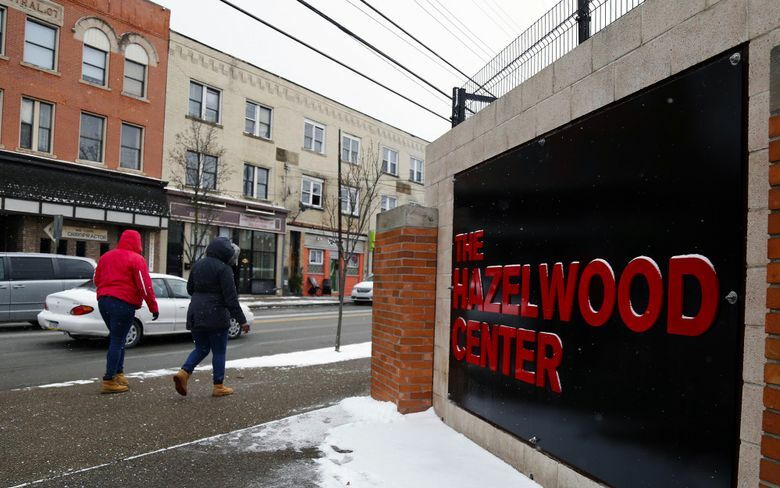 “That’s the biggest news in Hazelwood real estate in 50 years,” said David Brewton, a resident and director of real estate for the Hazelwood Initiative, a nonprofit working to get longtime renters into their own homes and shore up the central business district. Brewton said the deal sparked fears of speculation and worry that outsiders may commandeer a redevelopment process that neighborhood groups have been working on for years. The neighborhood’s roughly 650 renting households include many at risk of displacement if rents were to rise, Brewton said. 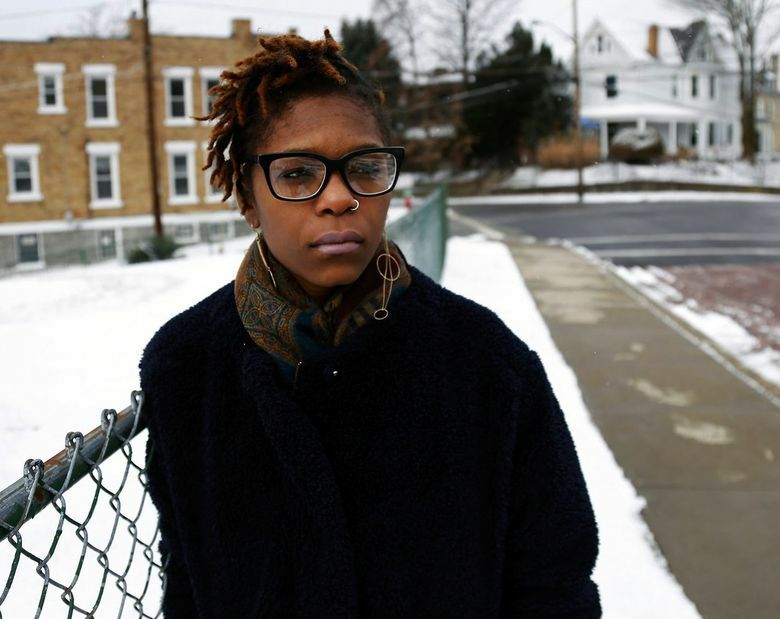 The Hazelwood Initiative — which owns properties ranging from houses to a former school and four major buildings in the business district, and is pushing for affordable housing in each — is essentially trying to build a safety net. 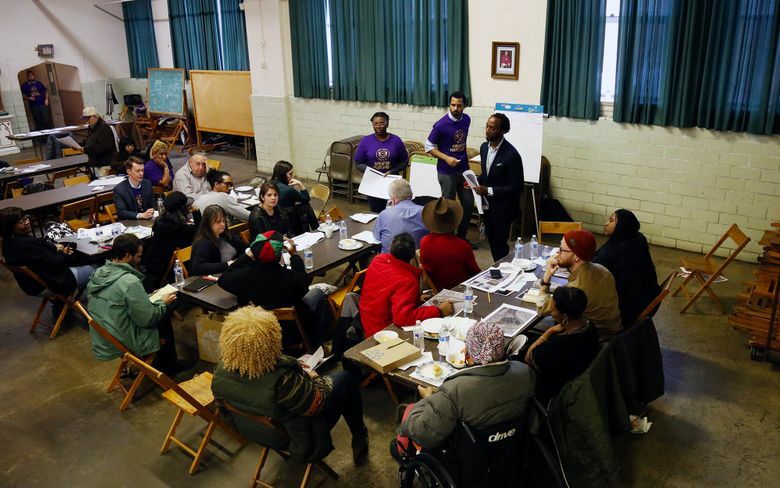 The Hazelwood Initiative’s February community meeting, held in the main hall of a senior center, began with the usual business. A police sergeant read out the month’s crime statistics. City transit officials gave a presentation on a plan to connect the neighborhood with Oakland, the home of Carnegie Mellon and the University of Pittsburgh. But this gathering was primarily for a single issue: what to make of Amazon. Brewton took a straw poll of the few dozen people in the audience. Would Amazon HQ2 be good for Pittsburgh? Folks voted yes, roughly 2-to-1. Would Amazon be good for Hazelwood? The vote flipped. Hazelwood, another resident countered, was in no position to turn down jobs. “When did the mills shut down, folks?” he said. Homer Craig replied with a view held by many here: “We wouldn’t get a single one” of the headquarters jobs. It’s more likely, Craig said, that locals employed at Amazon’s HQ2 would be staffing cafeterias or doing janitorial work. The 78-year old, retired after a career in the Pittsburgh Police Department, is proud of the community and wary of outsiders dictating its future. He had bristled earlier in the meeting at comments from a city transit official who referred to the neighborhood and the Hazelwood Green site as separate destinations on the proposed transit line. “Please, please, put it in a proper context,” Craig said. “When it was smoky, stinky steel mills, it was Hazelwood,” he said. Now that the city is trying to attract high-tech firms to the development site, he said, some seemed to forget about the neighborhood surrounding it. “It’s still Hazelwood,” Craig said.